DAYTONA BEACH, Fla. (June 15, 2017) – The 2017 American Flat Track championship picks back up this weekend with the OKC Mile presented by Indian Motorcycle in Oklahoma City, Okla., on Saturday, June 17. The return to Remington Park has been much anticipated following last year’s hugely successful inaugural stop at the state-of-the-art horse racing facility. It also marks the conclusion of a run of five consecutive Miles for the AFT Twins presented by Vance & Hines contenders. Even though three of the four Main Events leading up to the OKC Mile were taken by Mile master Bryan Smith (No. 1 Indian Motorcycle Racing backed by Allstate Scout FTR750), the spotlight has shifted back in the direction of his chief rival, Jared Mees (No. 9 Indian Motorcycle Rogers Racing Scout FTR750). Not only did Mees break Smith’s recent stranglehold on the top of step of the podium last time out at the Red Mile, but he returns to a venue in Remington Park at which he ran roughshod over the competition in 2016 en route to a dominant victory. Following seven of 18 races scheduled for 2017, the championship battle could not be any more competitive at the top where the two stand even at 152 points apiece. Smith holds the tiebreaker in his corner with four wins to Mees’ three, although Mees remains a perfect seven-for-seven in terms of podium results, as opposed to Smith’s six-out-of-seven. “I’m looking forward to OKC as it was a win for us last year and on a new track,” Mees said. “The track was demanding but fit my style and set up good. Now being on that Indian, I look forward to picking up where I left off with Lexington. While Smith and Mees have greedily hoarded all available victories, a couple of would-be race winners have been knocking at the door. Sammy Halbert (No. 69 Estenson Logistics Yamaha FZ-07) has continually built up steam during the championship’s stretch of Miles. After claiming a pair of fourths in Phoenix and Sacramento, Halbert worked his way onto the podium in third at Springfield. He then led much of the race and missed out on victory by an eyelash in an impressive runner-up performance in Lexington. Only one spot on the podium remains to complete that ascension. Certainly, no other rider appears as well positioned as Halbert to play the spoiler at the OKC Mile presented by Indian Motorcycle and bring the manufacturer’s season-long unbeaten record to an end. Meanwhile, Brad Baker (No. 6 Indian Motorcycle Racing backed by Allstate Scout FTR750) aims to break up the monotony up front himself while still furthering the Indian Wrecking Crew’s one-sided ownership of 2017 checkered flags. The 2013 Grand National Champion is a threat to win on any given race weekend; it seems more a matter of “when” rather than “if” Baker scores that long-awaited maiden victory as a factory Indian rider. Jeffrey Carver Jr. (No. 23 Carver’s BBQ Kawasaki Ninja 650) continues to hold down fifth in the championship order thanks to a steady showering of top-10 results. Carver heads a pack of heavily-armed Ninja warriors that includes sixth-ranked Jake Shoemaker (No. 55 Weirbach Racing Kawasaki USA Kawasaki Ninja 650), seventh-ranked Jarod Vanderkooi (No. 20 Richie Morris Racing Kawasaki Ninja 650), and eighth-ranked Davis Fisher (No. 67 Bob Lanphere Beaverton Motorcycles Kawasaki Ninja 650). Jake Johnson (No. 5 Harley-Davidson Factory Flat Track Team XG750R) is the highest positioned of the three-strong factory H-D contingent in ninth. However, considering the combined talent of Johnson and teammates Kenny Coolbeth (No. 2 Harley-Davidson Factory Flat Track Team XG750R) and Brandon Robinson (No. 44 Harley-Davidson Factory Flat Track Team XG750R), the works Harley-Davidson trio boasts the potential to break out and claim a race win at any time. Like Mees in AFT Twins competition, AFT Singles contender Tristan Avery (No. 16 Ron Ayers Honda CRF450R) looks to repeat last year’s success at Remington Park. Following a difficult start to his ’17 campaign, Avery has showcased sensational form in recent weeks and is chasing that first win of the season. After a dominant win at the Red Mile, Kevin Stollings (No. 99 Ben Evans Honda CRF450R) is looking to back it up in Oklahoma City. And of course, championship favorites Shayna Texter (No. 52 Richie Morris Racing Honda CRF450R), Kolby Carlile (No. 36 Parkinson Brothers Racing Honda CRF450R), and Brandon Price (No. 92 DPC Racing / Don’s Kawasaki KX450F) expect to be major players yet again. Points leader Texter has taken two of the season’s previous three Miles, while second-ranked Carlile and third-ranked Price have established themselves as fixtures at the front. Gates open at 2:00 p.m. local time, with opening ceremonies scheduled for 6:00 p.m. local time. Tickets for the Red Mile are now on sale and can be purchased at https://www.showclix.com/event/okc-mile-general-admission/listing. 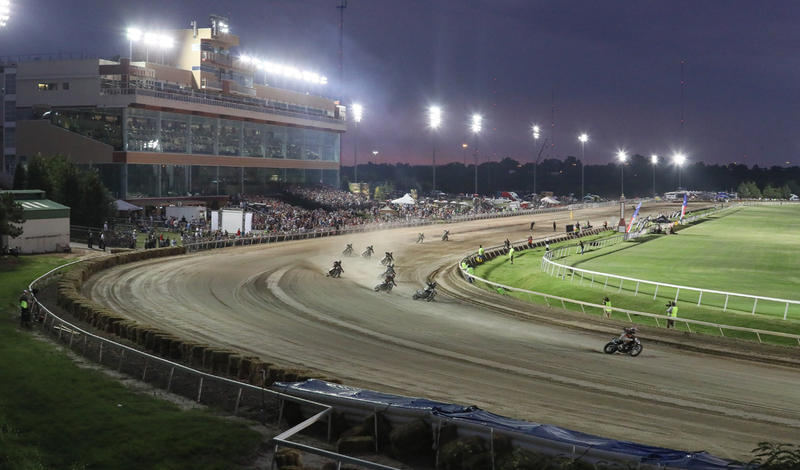 As part of American Flat Track’s television broadcast package with NBCSN, the cable network will air the OKC Mile in a primetime telecast on Thursday, August 24 at 10:00 p.m. ET (7:00 p.m. PT). The one-hour show will feature flag-to-flag coverage of both Main Events along with exclusive features giving fans a behind-the-scenes window into the sport. The complete television schedule for American Flat Track on NBCSN will be released in the coming weeks. Live streaming coverage of every second from the OKC Mile can be viewed on FansChoice.tv at www.fanschoice.tv/watch-live/american-flat-track. On-track action begins with the AFT Twins and AFT Singles practice sessions at 3:00 p.m. ET (12:00 p.m. PT) with Opening Ceremonies commencing at 7:00 p.m. ET (4 p.m. PT). NBCSN and FansChoice.tv are the official homes for coverage of American Flat Track events. All 18 rounds, from the season-opening Harley-Davidson DAYTONA TT to the American Flat Track Finals in Southern California, will air in one-hour primetime telecasts throughout the summer and fall on NBCSN. FansChoice.tv remains a cornerstone of AFT’s digital strategy and provides live streaming coverage of every event.